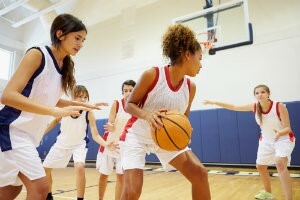 Basketball Injury Prevention Tips | Podiatry Associates, P.C. Winter is basketball season, with students and professionals of all kinds lacing up their high-tops and shooting hoops. With all its jumping, dodging, sprinting, and shooting, basketball is a dynamic sport that’s fun to watch and to play. Like most sports, however, those same factors also increase players’ risks for injuries. A smart athlete—even if you’re just a casual player—knows how important injury prevention is. Avoiding basketball injuries can help you stay in the game and skip being sidelined. Warm up every time – Don’t skip any warm ups. Cold muscles are much more prone to injuries. A warm up that dynamically moves your muscles and raises your heart rate helps prepare your body to be active without straining things. Condition yourself – Slowly condition your joints and muscles for basketball so your body can handle the stress. Start small, then increase your intensity and how much you do with time. Wear the right shoes – Shoes are crucial for protecting your feet and helping you avoid slipping on the court. Make sure your shoes have the right soles and provide the correct support. Hydrate – Without enough water, your body doesn’t function correctly. Drink plenty of water before, during, and after your activity to replace fluids you lose through sweating. Don’t over-train – Don’t push yourself past what your body can handle on a regular basis. The fatigue and overuse can actually cause painful injuries instead of helping your game. The more you care and take preventative measures, the more likely you can avoid an injury altogether. Invest in your body now so you can enjoy shooting hoops the whole season long. If you’re noticing any pain, or concerned you may already have an injury, let our experts at Castle Pines Physical Therapy and Cherry Creek Physical Therapy in Castle Pines and Denver, CO, help you. You can make an appointment with us online, or by calling directly at (303) 805-5156.